In the frame of the Ministerial Conference on Global Open Data for Agriculture & Nutrition & 4th Agritec Africa International Exhibition (14 - 16/06/2017, Nairobi, Kenya), the great commitment was reached between 15 African ministers, to draw and implement a Roadmap for the implementation of Open Data policy in Agriculture and Nutrition in their respective countries, with implementation and reporting mechanisms. The Ministerial Conference therefore resolved to take urgent actions to achieve sustainable agriculture, reduce food insecurity and nutritional challenges. The Sustainable Development Goal (SDG) 2 places focus on Agriculture, specifically putting it as a goal to end hunger and all forms of malnutrition by the year 2030. 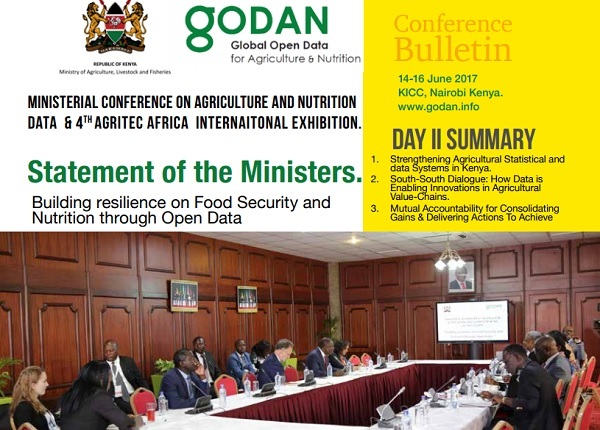 This essay highlights some key points from the Conference Bulletin (GODAN, 2017, PDF attached) that reports on the outcomes of the Ministerial Conference on Agriculture & Nutrition & 4th Agritec Africa International Exhibition, in particular - on how to implement an effective Open Data Policy framework in Agriculture and Nutrition for countries in Africa. Open Data is data that anyone can access, use or share. It can help shape solutions by enabling more efficient and effective decision-making at multiple levels across the [agricultural] value chain, fostering innovation via new services and applications, and driving organizational change through transparency. creates opportunities for people to influence their lives and future, reduce poverty, increase productivity, create jobs and participate in decision making. can only be achieved with a broad alliance of people, particularly women and youth, governments, small holder farmers, civil society and the private sector, working together to secure a world that is food secure, without hunger and malnutrition. to achieve sustainable agriculture, reduce food insecurity and nutritional challenges by constituting an African Intergovernmental Network on Open Data for Agriculture and Nutrition, under the auspices of GODAN. an Intergovernmental coordination mechanism to support the network. to support Governments ascribed to the Intergovernmental Network on Open Data for Agriculture and Nutrition, to strengthening their internal systems to produce timely, accurate and reliable data for Agriculture and Nutrition. [The GODAN initiative is pushing for open data for Agricultural development and food security, however, agriculture in the broader sense is also linked to trade, licensing of businesses, resource allocation, infrastructure development e.g. feeder roads and other broader functions that have a direct link to agriculture]. (iv) Provide support for developing countries to sustain national level platforms for agriculture open data that are interoperable. Mr. Zachary Mwangi concluded by saying that “Global Open Data for Agriculture and Nutrition (GODAN) is one of those partnerships that truly reflects this multi-stakeholder ecosystem in support of developing countries”. "Let’s work to encourage cross border networking and sharing, explore formation of South-South data sharing with other nations", - Dr. Muchiri Nyaggah - closing remarks. Glance down at the full Conference Bulletin (14-16 June 2017 KICC, Nairobi Kenya, GODAN) - HERE, to get more insights. Good reading !